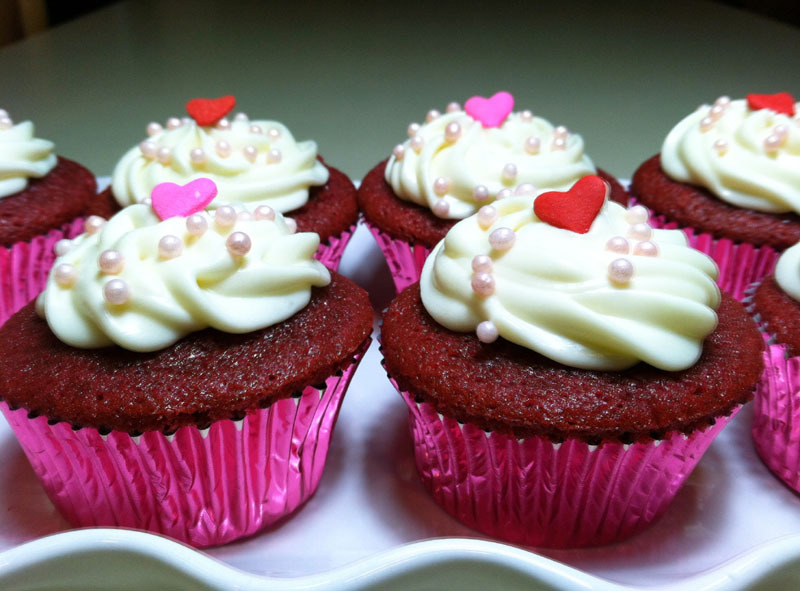 Rose Velvet Cupcakes Recipe for Valentine’s Day! One day each year is devoted to the celebration of LOVE and tomorrow is that day! Chocolate, hearts and roses tend to emblazon Valentine’s Day celebrations. These iconic images are meant to guarantee a sweet and loving celebration. My sweetheart deserves something special for our Valentine celebration. It would be wonderful to combine the chocolate, hearts and roses to create a sweet extravagance just for him. I would like to bake something that hints at all three Valentine elements but when combined becomes something spectacular. Rose Velvet Cupcakes! The chocolate in a velvet cupcake is subtle and delicate; the rose color intertwines the floral element and finally the delicious cream cheese frosting, topped with a red heart, will make these truly spectacular! In a large mixing bowl add the eggs, corn oil, buttermilk, pink liquid food coloring, vanilla extract, distilled white vinegar, and water. Beat with an electric mixer on medium speed until well blended. The mixture will be a bright shade of red. Mix in the dry ingredients on low speed and beat until smooth, 2 – 3 minutes. When the cupcakes are cool frost with your favorite cream cheese frosting and add a red candy heart and a few candy pearls to embellish your cupcakes. Enjoy!